It really is true that Britain is a nation of pet lovers! Everywhere you go you can see dogs being walked or joining their owners in pubs and cafes. Cats strut haughtily around the streets - graciously allowing us to share their territory. 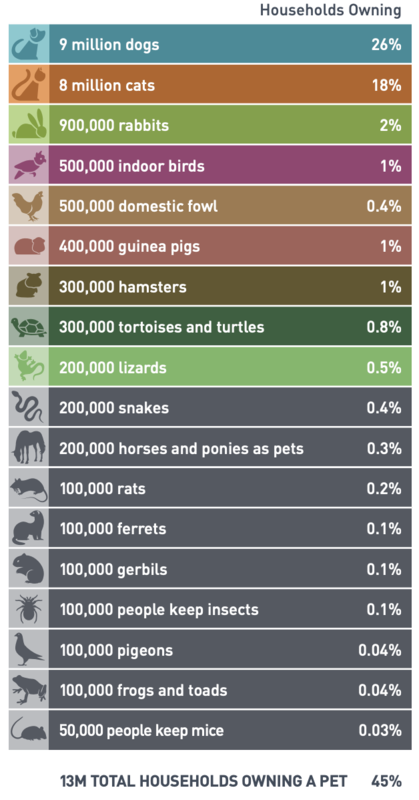 Not to mention the melangerie of rabbits, guinea pigs, hamsters, birds, fish and even chickens that live in many homes. But not only is the evidence all around us but we also have numbers to prove it! Every year in the UK a Pet Data Report is produced by the PFMA (Pet Food Manufacturers Association). The report is based on average data across two years from a sample size of approximately 8000 households. In 2018, the research found a growing number of households with pets. 45% of UK households (13 million) now own a pet. This figure has increased 600,000 since 2017, and is even higher (53%) amongst households with children. Dogs and cats are still the most popular pet - owned by 26% and 18% of households respectively - but as you can see from the infographic below (courtesy of pfma) there are many other types of pets also residing happily in the UK! Another interesting thing is the growth of what could be described as the pet economy. For example think of the growing numbers of pet stores, offering everything from practical items such as food and beds to increasingly sophisticated toys, gadgets and pet grooming products and facilities. Then there are many people who are forging independent careers in the pet sector, such as pet groomers, dog trainers, dog walkers, cat sitters and pet day care centres. So as well as owning pets we are increasingly interested in looking after them well and pampering them. Pets become an essential part of our lives and our families and this trend shows no signs of slowing down. If you are already a happy pet owner, you will be aware of all the above. But what you may not be aware of is that at Venture Studios we offer specialised pet photography services. Our Just For Pets photography experience includes a 1 hour pet friendly photo session valued at £150 and you will receive a 7" x 5" framed gift worth £95. We also donate £5 of every Just For Pets Voucher sold to The Dogs Trust. So this spring why not make the most of your time with your pet and arrange a Just For Pets photography experience with Venture Studios? As well as being a special time that you can enjoy together, you will capture that time forever: giving you some treasured memories of your pet to cherish for years to come. 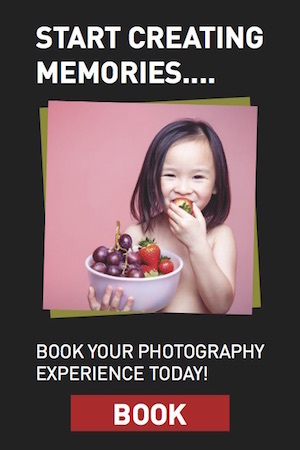 To arrange your Just For Pets photography experience you can either book online, call us on 0845 121 1085 or use our Studio Finder to find your nearest branch. We look forward to meeting you and your special pet and helping you to create some precious memories together.